I bought this in a mini bottle, and to be honest, it didn’t look all that exciting. But, for $2.49, a nail polish nut can’t help herself, can she? In the bottle, it’s a plain medium blue cream. No hint of green, red, grey, or most any other tone. But, to my astonishment (That’s right! Astonishment! ), one coat on and it was like the color reacted with the air and became vibrant! Ooh, I was in love. This color difference is a little less obvious in the photo, I think due to the sunlight. In dimmer indoor light, it’s like the nail color and the bottle color are two entirely different colors. 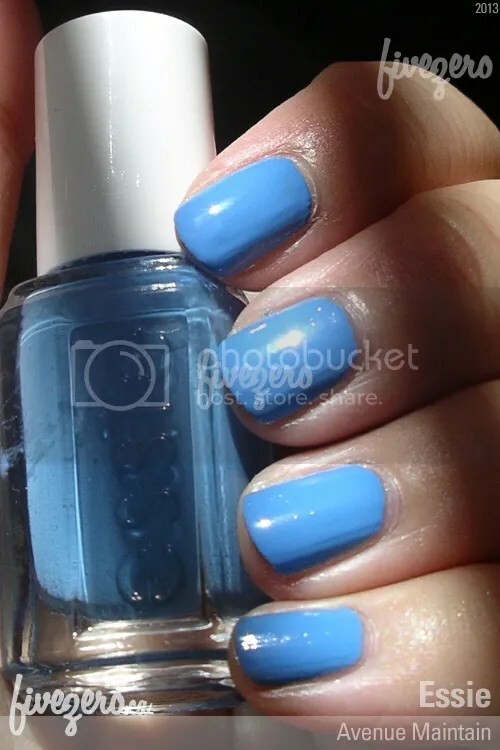 Avenue Maintain is a great, rich medium blue cream on the nail, and it really has a nice consistency—it’s almost, but not quite, a one coater. Two coats are perfect. Next: sparkling up this blue cream! Oh you should! 🙂 I am tempted to pick it up in the regular size! Wow, that is vibrant for $2.49! Amazing!